I am looking at an appraisal on my desk right now where the appraiser drove from Fresno to Mather to complete the appraisal. Google Maps estimates the 178-mile trip would take 3 hours and 10 minutes (that’s only one way – 356 miles roundtrip). This distance is a very long way to go for a standard tract home inspection, yet technically acceptable so long as the appraiser truly knows the local market. Keep in mind the roundtrip in gas would’ve cost about $45.00 based on 30 mpg. In this case it’s questionable to think the appraiser understands the local market. There is no mention of “Independence at Mather” being a PUD with a monthly HOA fee. In fact, the appraiser says there is no HOA fee. There is no mention of the neighborhood being located within close proximity to the Sacramento Speedway or Mather Airport (formerly an air force base that is a Superfund site). The appraiser probably didn’t know portions of the neighborhood were formerly military barracks before new houses were built by SHRA and KB Homes. The appraiser was likely not aware of Aerojet, the meat rendering plant nearby, the limited amount of commercial properties and future plans with the Anatolia area. 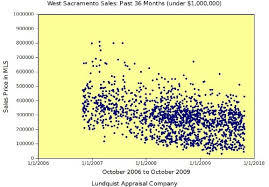 The appraiser most likely was not aware that Mather is not a city or CDP, but rather an area of Sacramento County. Questions: How do you think it might impact value on an appraisal report if the appraiser does not know the local market? If you are an agent, do you find most of your appraisers lately have been local, or are they coming from far away? It’s my youngest son’s birthday tomorrow and it’s also the one-year anniversary of the Home Valuation Code of Conduct. People ask me all the time what I think about HVCC, so I figured on the eve of twelve months of HVCC, it would be appropriate to have a little discussion. In short, I think the Home Valuation Code of Conduct has been difficult for the appraisal industry, the consumer, and the real estate industry. Appraisers definitely make less money now for loan work. I know, who cares, right? But listen between the lines because what if the government stepped into your industry and said you could no longer do business with clients you’ve had a relationship with for years. Many appraisers have gone out of business because their client-base was swept under the rug last year when HVCC was implemented. Secondly, the consumer pays more for a real estate appraisal now. Under the direction of HVCC, appraisals geared toward Fannie Mae & Freddie Mac cannot be ordered directly by a lender or broker, but must be ordered from a neutral third-party (often times an AMC – Appraisal Management Company). These companies charge the consumer more than what an appraiser would typically charge, and many times pay the appraiser quite a bit less than what is customary in the market. There are some upstanding AMCs out there that I am thankful to do business with, but on the other hand it’s too bad to see some companies really taking advantage of the situation at hand. For example, I received an email yesterday from an AMC offering appraisers $125 for an appraisal order, while their website shows fees at nearly $500. Lastly, HVCC has definitely impacted the real estate market. Since appraisers cannot be chosen directly by lenders, loan officers or brokers, the best appraiser for the job may no longer be hired. One might make the case therefore that there is a serious issue right now with the quality of real estate appraisals because of less experienced appraisers being hired to complete appraisals they are not as qualified to do. That’s definitely the case, but on the other hand I also think HVCC has been a bit of a microscope to the appraisal industry in some regards because it has illuminuated some shoddy work in the appraisal field. Ultimately, I’m thankful that HVCC only applies to loans geared toward Fannie & Freddie (HUD/FHA has something similar in place now too). I still do many appraisals for investors, Realtors, and home owners, and these types of valuations are NOT affected at all by HVCC. Of course I’m not immune to some of the consequences of HVCC as I mentioned above, and the whole thing upsets me, but I’m choosing to focus on other things. I may be limited in business right now with what I can do for loan appraisals, but I can still chase other avenues of appraisal work such as bankruptcy, divorce, estate settlement, investor valuations, and assignments from local governmental agencies. In fact, just yesterday I had another Sacramento estate settlement retrospective appraisal come my way. I know this almost sounds like a positive spin, but there is something philosophical here for me because it’s about focus. HVCC has been a sincere difficulty, but focusing all my attention on it and being negative won’t do me any good (and it won’t pay the bills either). Therefore HVCC won’t define me today, and it won’t be fuel on the fire tomorrow either on the one-year anniversary. Tomorrow I’ll be burning some hot dogs on a grill, enjoying the company of family as we celebrate my youngest son’s birthday, and intentionally not focusing on HVCC. I’d like to hear from you as a real estate agent, consumer, or appraiser. How have you seen HVCC impact the real estate market over this past year? I’d like to take a few moments to reflect on my favorite appraisal assignments of the year. Maybe I’m jumping the gun a bit since 2009 is not quite over, but that’s okay. I won’t get specific about addresses or location because I take client confidentiality very seriously. Facuets Left On: I appraised a bank-owned property in Solano County. It was a very nice property, but unfortunately all faucets and spickets were left on (with clogged drains), so there was extensive water damage. It was unclear if the damage was done by the disgruntled home owner or a vandal. Oak Park Fixers: This year I appraised quite a few fixer properties in the Oak Park area of Sacramento that were purchased by an investment group, re-habbed, and then re-sold on the open market to first-time home buyers. It’s nice to be a part of a project where the end result is good for the community. Vacant Subdivision Land in Sacramento: Acting as a property tax consultant, I valued two parcels in Sacramento County under the supervision of an AG (Commercial Appraiser). These sites were scheduled to be finished out as a subdivision, but then the market burst and subdivision building virtually stopped. Spring Water & Cesspool: I appraised a house in Placer County that was on spring water and a cesspool (as opposed to a well and septic tank). Do you think this would have an impact on market value? How much of a price discount would it take for the typical buyer to look over an atypical feature such as this to purchase the property? Dilapidated Fourplex: This property was interesting because it had repeated damage from squatters. I had to climb through a window to inspect one of the units too, and I cut my finger on broken glass (that made me remember this property even more). Upgraded Duplex: The residential-income market in Sacramento saw a huge decline in value over recent years. All of the latest sales in this particular neighborhood were fixers. So what is a bright and shiny upgraded non-bank-owned duplex worth in a marketplace of REO fixers? Rancho Cordova Property: I’ll be honest. Since my office is located in Rancho Cordova, it sure is nice to get local assignments in the same city. I don’t mind at all driving to other counties, but it’s a great thing to travel a mile from the office to take care of business. My business in Rancho Cordova definitely increased this year. Divorce Appraisals: I do work for home owners and attorneys during a difficult time of life. It was a pleasure to provide excellent service to home owners in need this year and at least make the appraisal process smooth in the midst of a challenging situation. I grew up in a divorced home and I know it’s not an easy time of life. Pre-Listing Appraisals for Local Agent: I am a huge fan of working with local Realtors and it was a pleasure to establish a new working relationship with a particular agent who began to rely upon my knowledge and services this year. This year I had more referral work from Realtors and that’s a wonderful thing!!! I am also really grateful to be more connected to some stellar local real estate agents on Facebook and Twitter too. Ripon New Subdivision: There was nothing terribly complex about this assignment, but I really felt like I did a solid job on this appraisal in Stanislaus County and my client was very happy with the end-product. It’s just one of those I remember putting in a good amount of time and really enjoying the finished product. I appreciate all my clients and colleagues who made 2009 a fantastic year. This has been a trying year for the appraisal industry in light of HVCC, but I am grateful nonetheless for all the good things that happened this year. Thank you. If you are a real estate agent or home owner, what was the best experience you had this year with an appraiser? If you are a real estate appraiser reading this post, what were some of your favorite assignments this year.